Standing at the now-familiar-to-me mouth of Horse Canyon, I looked across the Escalante River to the opposite bank. The water was fairly clear, but somewhat deeper than that which seemed prudent to cross exactly at this point. I watched Ray head downstream and start crossing at a break in the streambed. The water was shallower there and it looked like a better place for Susie and me to cross. So cross we did, and struggled up the opposite bank. I looked around when we reached the top, and was filled with a vague sense of uneasiness. I KNEW I had been here before. Twice actually. But it just didn't FEEL like I had been here before. The bench on which we stood was covered with sand, and little if any vegetation. OK, there was vegetation, but what was there seemed a little out of place I thought I recalled there being some trees against the far canyon wall, and there still were, but things just felt different. We plodded along upstream traversing the bench, trying to find a critter path, or even better, a human path. No such luck. When we got the river bank, where I knew it was time to find a place to re-cross the river, we were met with piles and piles of dead vegetation, a challenge through which to find one's way. It kind of felt like trying to make one's way through a slash pile following a logging operation. We finally got to the bank and prepared to cross the river, surveying the comparable slash pile at the top of the opposite bank. I turned to Susie and exclaimed, "This is going to take a while......."
The conception of these canyon trips has always been an interesting process, one made more challenging by the fact that after doing these for over 25 years, it is hard to come up with a new route that a) can justify hopping on a plane, flying halfway across the US, driving hours and hours to a trailhead, and spending a week of one's vacation in what Susie used to refer to as "The Ditches" and b) something that many of us have not already done before. 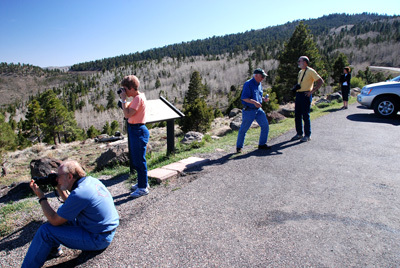 But sometime last year, near the end of the Boulder Mail Trail trip, Susie and Sue were talking about next year's trip, and were asking if there was a practical way to see this place called Upper Gulch. 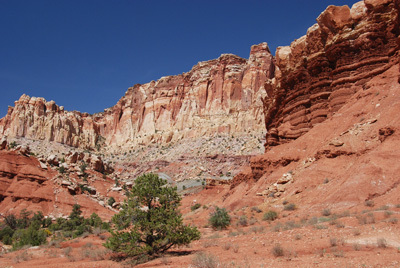 This is the part of The Gulch that is upstream of the Burr Trail. I had ultimately looked at a planning map, and decided that an all north-of-the-Burr-Trail trip really would not work for this crew, and then started considering what else we might do in the area. And then I started thinking about who would be on this trip, and that re-opened some previously discarded possibilities. In 1986, eight of us, including three that would be on this trip: me, Will, and Ray, had come down Harris Wash, gone up the Escalante to the Mouth of Horse Canyon, gone into Little Death Hollow, then to the mouth of The Gulch and up The Gulch to the Burr Trail. But 21 years is a long time, and it seemed to me that if we added a few new twists, it would "feel" a little newer. So THE PLAN evolved into thus: leave a shuttle car/food cache at the point where The Gulch crosses the Burr Trail, and then drive everyone to the Wolverine Creek trailhead. We would hike down Wolverine to Horse, and then on to the Escalante River. Up the Escalante to the mouth of The Gulch, then up The Gulch to our food cache, resupply for two nights, and hike into the Upper Gulch, where we would camp for a couple of nights near the mouth of Water Canyon, allowing a long day hike up to Lamanite Arch. Of course, as time has passed, even getting folks to the trailhead has been getting increasingly complex, and the mother hen in me was working overtime. 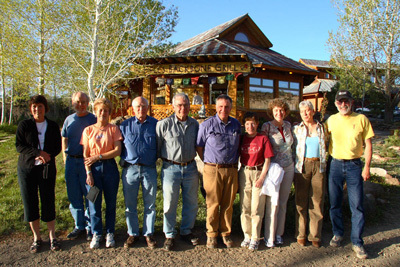 The plan was to get everyone to meet at the Hell's Backbone Grill in Boulder, Utah for a 5:30 dinner on Saturday evening. Remember the good ole days, I was commenting on to one trip participant, where everyone flew into the gateway city on the same flight from Knoxville (with Andy and Sue coming in on another flight from Austin)?? Well, times, like the canyons, have changed. Sure, Sue and Andy were flying in from Austin, but Terri was driving to Nashville and taking Southwest to Salt Lake thru Las Vegas, and Ron and John were flying from Knoxville through Cincinnati to Salt Lake. Susie and I were driving down from Bozeman to Salt Lake, all scheduled to get in by late afternoon on Friday. Meanwhile, Kim and Will had flown out a week ahead of the main party, basically to do a week of day hiking in the canyon country. Ray had flown out Tuesday to do some constructive goofing off, and Barbara was driving up from her volunteer position at the Southwestern Research Center of the American Museum of Natural History. Capitol Reef was its usual loveliness. We really did not have time to take a hike, but the folks who had not seen it previously (and Susie and I, who had camped there last year) enjoyed the scenery. Best quote of the trip: At a turn-out near the end of the paved scenic drive south of the Fruita campground, we ran into a mid-50's couple from Quebec, who had been in the US for ten months, sea kayaking from Alaska to California, sightseeing and enjoying our spectacular National Parks. The guy's comment, while gesturing with his arms to the soaring canyon walls, was this: "If there IS a heaven, it is surely right here on earth. How can it be any more beautiful?" Amen to that, brother. We could tell during our drive over Boulder Mountain that this had been a lower snow winter. Nowhere near normal snows in the high country. It was a bit hazy already, signaling the arrival of a high pressure system and associated high temperatures. We knew the next couple of days were going to be warm. Toasty is a better term. Just what you don't want at the start of a hike. Anyway, we all convened in the parking lot of the Hell's Backbone Grill at the appointed hour. Barbara looked terrific (nothing like being with a much younger guy in Arizona to tone up the flesh, shall we say) and Kim, Will and Ray all looked rested from their pre-backpack vacationing. Will commented during the usual wonderful dinner that the Grill serves that he and Kim had eaten basically everything vegetarian that the Grill offered in their stay in the area, and that the two of them would eat lightly tonight, and have a burrito afterward at one of the other restaurants. Will is getting increasingly thrifty as he ages. After dinner, we headed over to our rooms at the Prospector Inn in Escalante. Seems like the best place to stay in town. This year, there was a new woman manning (sorry) the front desk, and what a contrast to the previous years. This one was happy to see you, upbeat and seemed to have an impish glint in her eye. What a nice change. I guess we all unpacked and I opened a couple more bottles of "imported" wine. Ray must have had three glasses of the Yellow Tail Shiraz. Not sure it helped him sleep better. Susie did not drink much as she seemed to have run out of go juice mid-afternoon. She started to worry about her performance on the trip, but as would be expected, those worries were totally unfounded. To view supplemental photos of this trip, go to our TwoHikers PicasaWeb gallery.